Our first ShinnCon (an at-my-house 12 hour game day, emulating a ‘mini-con’) was a great success! 9 players plus Stan as GM / referee. I’ll post more about the adventures and events of the day, but before I forget I wanted to jot down some notes on things on things that went well, things I wish I’d done better, and future tools and accessories I want to create for the next game. Also, I hope to do more posts describing the game and posting PDFs of the tools I used which I reference below. Demo Mini-Game — I ran a quick skirmish battle for the players with pre-gen characters. Battle fed into the backstory that setup the main adventure. This let them see how combat and skills worked and let them have a chance to (potentially) die before rolling up real characters and getting into a high-stakes combat with their final player character. Pipe Cleaners — I gave everyone a Pipe Cleaner — just something to fiddle with during the game. We ended up with a Star Wars Imperial Star Destroyer and other cool creations. Campaign Charter — We went through a special campaign charter process to come up a with a group social contract of what we wanted in the game, our reason to adventure, etc. This worked well. I’ll post more on this at some point. Characteristics Cards — Not to be confused with Traveller UPP Characteristics, this is things like Character Quirks. This was a nice exercise. Connections Cards — This was very valuable and fueled the day’s adventure. Players created Friend, Family and Foe NPCs for their characters. Very nice. Ad Lib Adventure™ — I gave the players an initial scene but asked them questions (DungeonWorld style) to mutually create the adventure. The “Ad Lib Adventure” phrase is a Trademarked term I’ll be using for some a published product I’ll be revealing hopefully this Fall. Con Packet — I gave players handouts, rules, etc. I think this was good. One element was a Future Games Survey to see what games to have in our backlog, and how often folks wanted to meet. 4×6″ Character Sheet — I created a 4×6″ notecard format character sheet that included a spot for weapon stats without looking at a book. Very handy. Will post after GenCon. Intrigue — One character — ‘The Cube’ (J. J. Jameson) — did a great job of solving the intrigue around who was behind the assassination of a noble’s son. Very nice! Skill ‘levels’ — I was advising people to add their skill as a +DM to skill rolls, but I didn’t advise folks where certain skills are more like ‘levels’ and each level has a +2 or +4 modifier per level. Will fix this next game by using a Rob Eaglestone suggested house rule to pre-bake these modifiers into the skill level. Range — I need to have a change handy with the range definitions. I also need to have a good conversion of ranges for gridded combat — meters per square. Should have an option to zoom out to different scales if we’re doing really long range combat. Also should consider house-ruling a 13th Age style ‘near’, ‘engaged’ type system. System Travel Time — Need to create a table for quick reference with travel times for planet to planet’s orbit, planet orbit to another planet or asteroid belt in the system, planet side to jump, etc. Law & Tech Level — I failed to decode the UWP for the star system and players needed to know the law and tech level. I want to create a quick cheat sheet to decode UWPs. Markers for Name Tents — I had name tents for the characters but I forgot to pass around a marker so players wrote up their names in pen or pencil and it was hard to read. 4×6″ Card Examples — On the Characteristics and Connections 4×6″ card tools I handed out, I had examples that had sentences with Blanks. Multiple players though each example had to be filled out. I need to change the format of the cards to make this more clear. Ammo Tracking — I didn’t review the ammo and clip capacity information for weapons so we ended up not tracking ammo. I’d like to add this to our character sheet and have players track this in future games. Vehicle Speed/Armor — I didn’t have the grav bikes stat’d out. When players decided to shoot the grav bikes I just made up stats on the spot. Also, it became relevant to range how fast the bikes were coming into to attack. Note to self: stat out anything the players might shoot at in advance. Stunned Rules — I found the system not so much ‘lethal’ as it was ‘one shot and you’re unconscious’. Need to review the stunned house rules some have proposed and see if this is a house rule I’d want to employ. Bridge Crew Ship Battles — I want to review which Traveller rules are best for ship battles with bridge crews and figure out how best to run those battles so everyone has a meaningful role and has fun. Mass Fleet Battles — Like the above, but with multiple ships. Need to figure out the best rules for lots of ships in the battle. Boarding Action Rules — Need to review best way to handle boarding actions. Replacement Characters — Classic Traveller character generation is cool, but takes a while. If someone dies, I don’t want to slow down the game for someone to generate a new character. Need to think if the rules should be that players go ahead and roll up the replacement character as homework, re-skin their old character with a new name, use pregens, or what. Skill Tests — I used a ‘roll under your characteristic’ rule for Skill tests, but I want to review rules like Mongoose Traveller to see if there is a more elegant way to handle this. 15mm Minis — I want to paint up some nice 15mm miniatures. I am considering doing different colored bases to make the minis easier to identify for PCs. Need minis for NPCs (Zhodani, soldiers) and alien creatures, etc. 4×5′ Battlemat — I’m considering making a 15mm scale large battlemat (with 0.59″ squares) printed at bannersonthecheap.com for $21. Ship Battles — Need to figure out the best way to do ship battles — maybe minis, or maybe printed counters/pogs. Hex Space Battlemat — Need to solve for getting a hex space battlemat. Maybe another custom matt from bannersonthecheap.com, or painted using a Litko hex stencil. Ship Expenses and Upkeep — Players have two ships at this point I think so we’ll need to decide what sort of bookkeeping we want to do (or not d0) regarding tracking ship expenses. I don’t care that much for the ‘accountants in space’ dimension this has the potential to take on, but will talk to the players about it. Ship Maps — One of the ships was a luxury yacht. I’d like (ideally) to use ships that we have 15mm scale deckplans for, like the Free Trader Beowulf or the scout. So, need to talk about what we want to do on that front. Sounds like a grand time, Stan. Sorry i missed it. It was amazing! I hope you can make our next game. 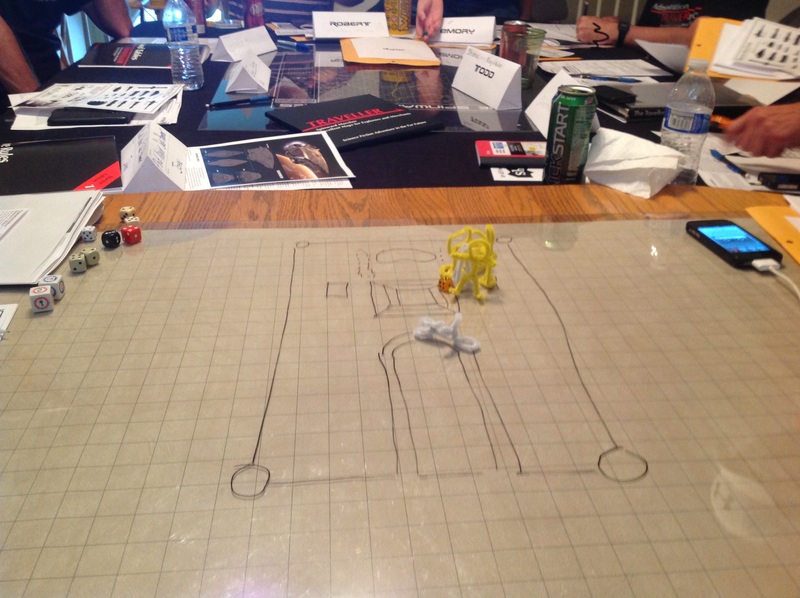 Possible the most fun 12 hours of roleplaying I’ve ever had.